It’s pretty clear that I’ve always been a “Say Cheese…Cheese!” kind of girl! It’s rare to see a photo of me smiling without my teeth showing. I love my smile and don’t mind showing all 32 every opportunity I get! Besides, “A smile is the best makeup a girl can wear” and my smile happens to be my favorite accessory! However, I am an avid red wine drinker, I enjoy tea tastings, and I absolutely have to have my coffee, so over the years my pearly whites have gotten a little dingy. In the past, I’ve attempted to use Crest Whitening Strips but with my sensitive teeth, the strips always left my teeth and gums feeling irritated. Plus whitening strips only whiten the front of your teeth. 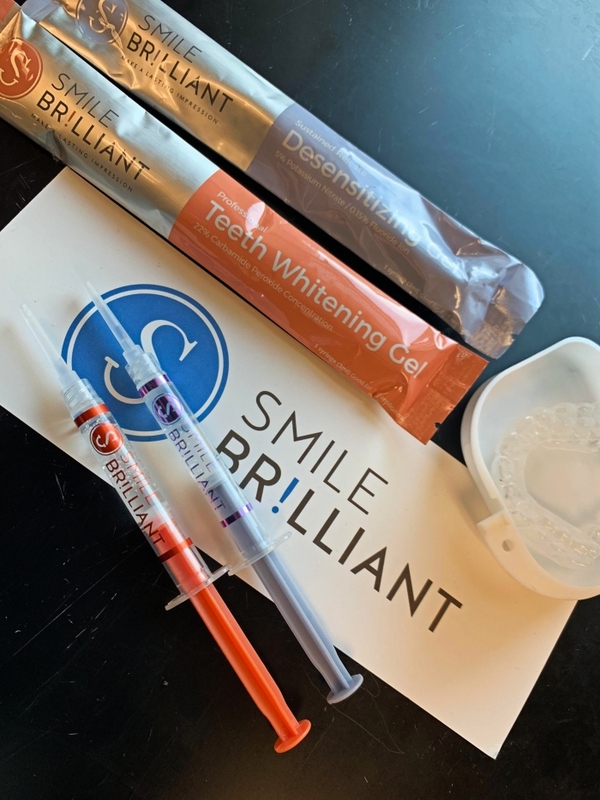 When I was contacted by Smile Brilliant to try their at home-whitening kit, I was pretty excited! The invitation was very timely as I had recently inquired from my dentist about options they had for teeth whitening but found their prices to be a little too expensive. 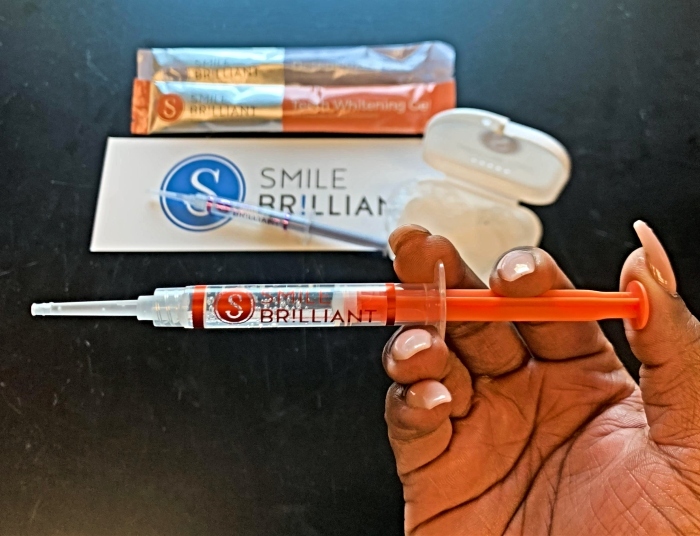 When I learned that Smile Brilliant is the #1 dentist recommended teeth whitening system that is up to 5 times faster and comes with custom-fitted whitening trays, at a much more affordable cost, I was confident in my decision to try Smile Brilliant. Anything I can accomplish in the comfort of my own home while rocking sweats and a hair bonnet will always be an added bonus! 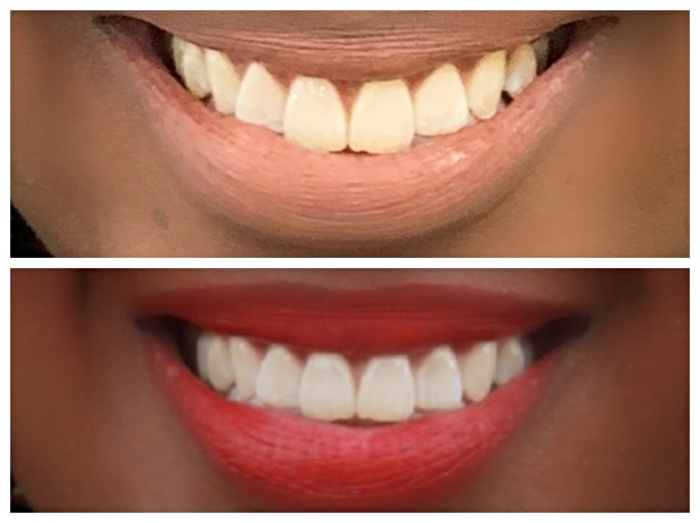 The fact that I was able to get amazing results as if I were making weekly trips to the dentist, is pretty awesome! So here is how the process works! 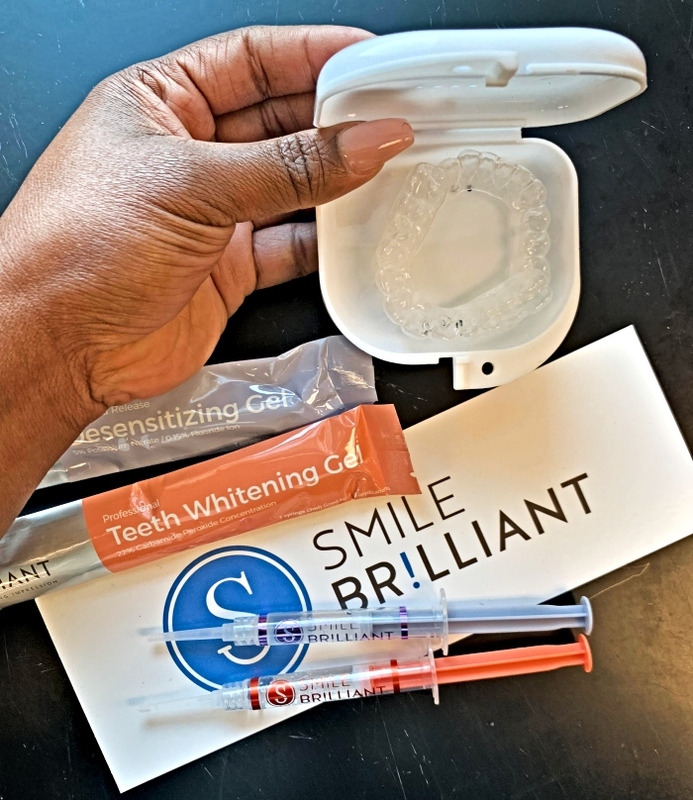 I answered a few questions about my dental history and personal experience with teeth whitening and a few days later I received my Smile Brilliant package in the mail. 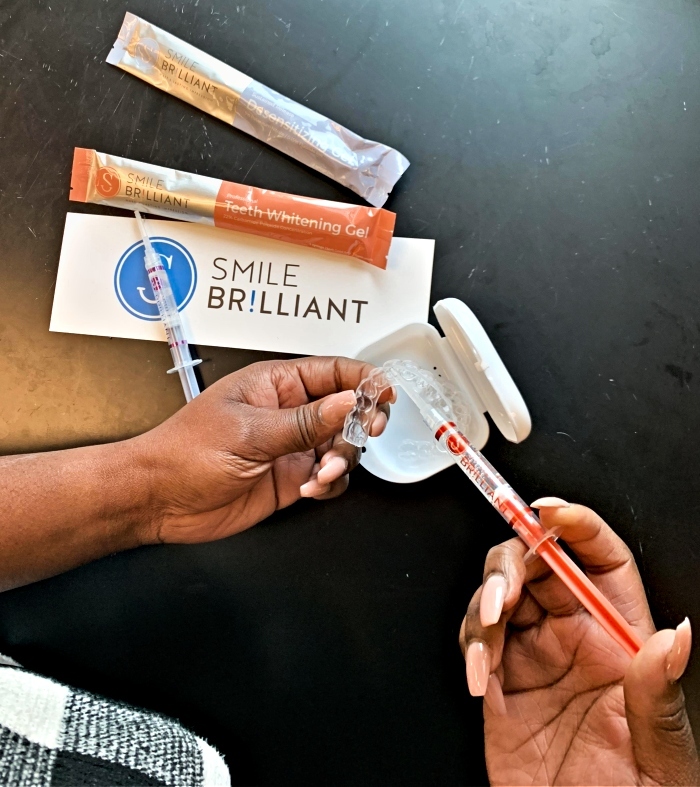 It came equipped with 3 whitening syringes, 3 desensitizing syringes, and catalyst & base pastes that are used to create your custom whitening trays. Included in the package were also detailed instructions, and pictures of what to do and not do. I love when I have visuals to follow along with. Having this, made the initial process of creating my trays a breeze! To make my own teeth molds, I mixed the catalyst and base pastes together then placed the mixture into the blue tray provided. I pressed them evenly into my upper teeth to make my personal molds. I repeated the process for my lower teeth. After the molds were made, I let them sit for 30 minutes, rinsed them, allowed them to dry completely, then sent both of the molds back to Smile Brilliant in the envelope they provided. 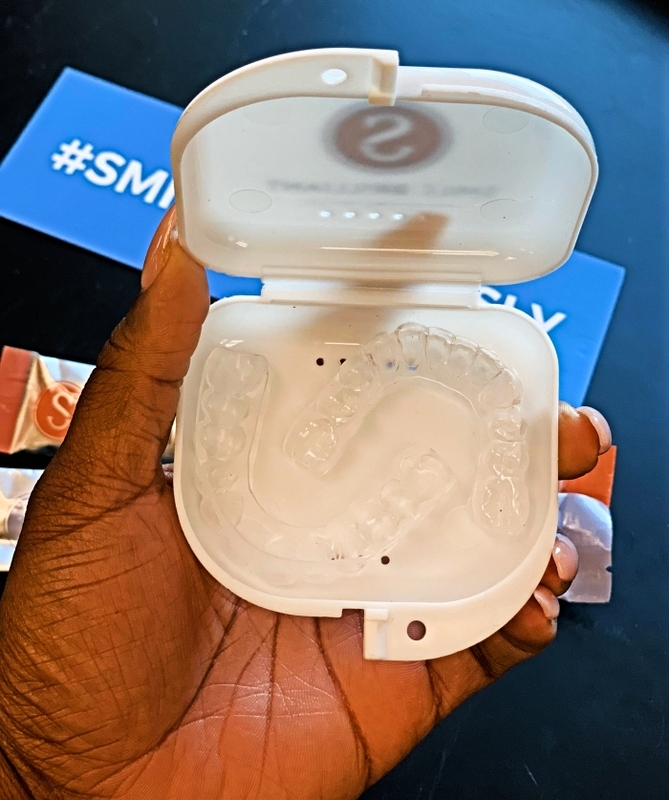 A week or so later, my custom-fitted whitening trays were delivered and I was ready to start my at home teeth whitening process. The initial process of creating the trays was seamless, fast, and very user friendly. Before whitening, I brushed my teeth with water only. I used about 1/3 of the whitening syringe for each session and by the end of my entire teeth whitening process, only went through one syringe and a little of the second. I decided to do the whitening process every other night for 45 minutes before going to bed. Doing it before bed is ideal because it’ll ensure that you aren’t coming in contact with food or drinks that will reverse the whitening process. I did this for a little over a month. 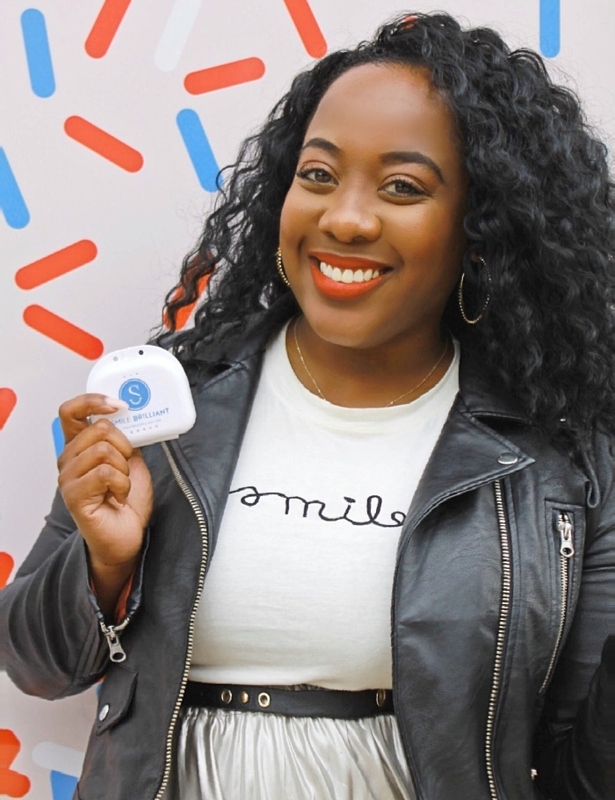 The custom whitening trays fit my teeth perfectly, so I was confident in knowing that all of my teeth and crevices were getting whitened evenly. At first, I experienced a little sensitivity. It was expected because I do have sensitive teeth. To combat that, I rubbed a little coconut oil on my gums before inserting the trays and it helped tremendously. After the first couple of weeks, I didn’t experience sensitivity much at all. I definitely recommend using the desensitizing gel for about 20 minutes after each whitening and even on days you don’t whiten because it helps with any sensitivity you may experience. The first few times I whitened I would notice white streaks on my teeth. 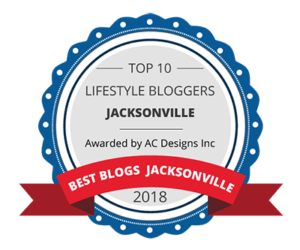 I thought that I was doing something wrong and that my teeth would only whiten in those areas but I learned that the white streaks were simply de-mineralization of my teeth caused by the whitening process and that it was completely normal. Over night my mouth re-mineralized my teeth and by the next morning my teeth looked pearly all over. It was amazing to me how quickly the process worked. I started seeing results as early as after the first couple of days. Of course the longer you do the program, the whiter your teeth will be. 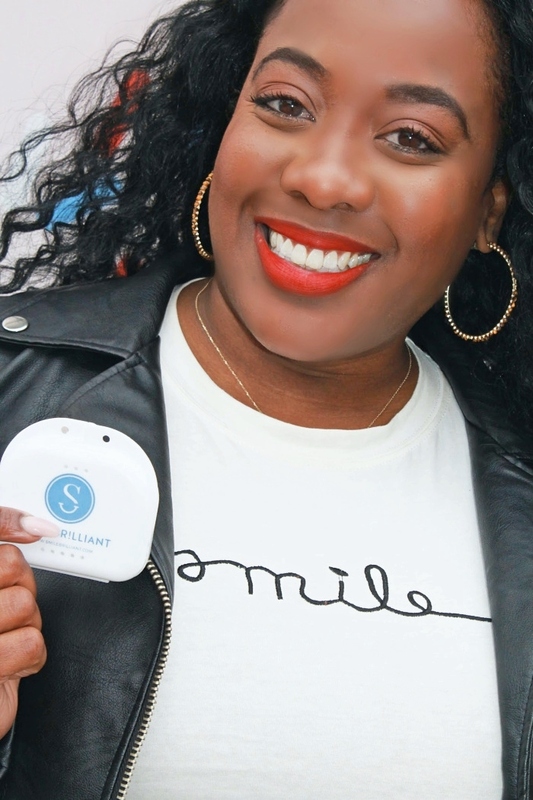 Smile Brilliant recommends you whiten from 45 minutes to 3 hours. 45 minutes was plenty of time to do the trick for me. As I mentioned earlier, my teeth before were a little dingy from my beverages of choice and this program brightened up my smile beautifully! It wasn’t too drastic and my teeth are now a natural bright white. 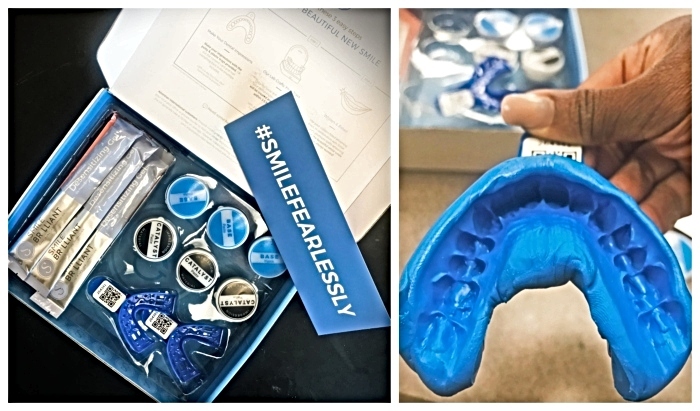 As someone who is proud of their smile, I was very pleased with my experience with Smile Brilliant! I was impressed at how quickly years of coffee stains were removed! To keep it all the way real, I don’t ever plan on giving up my obsession with coffee, tea, and wine so needless to say, Smile Brilliant will forever be in my back pocket to keep my pearly whites, sparkly! Here’s my next favorite part! 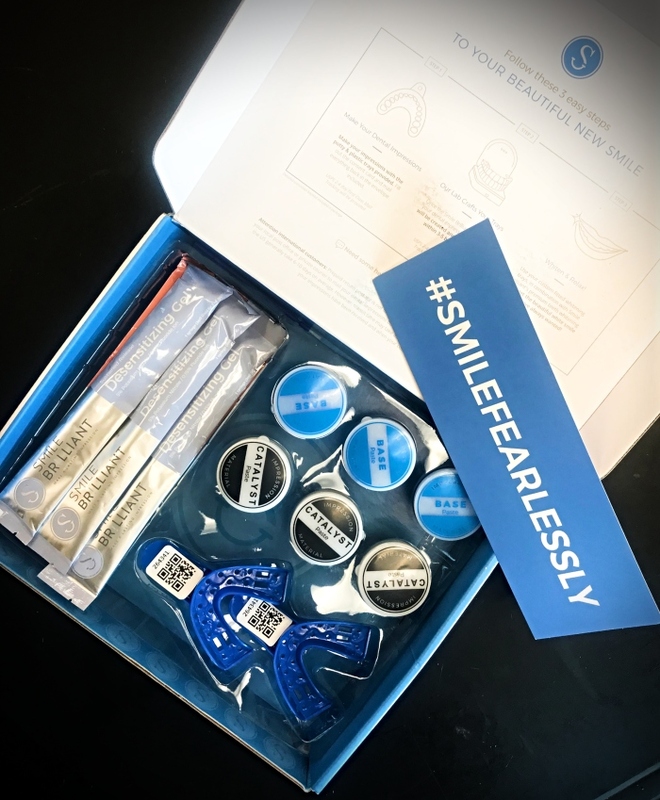 You all have a chance to win a FREE Smile Brilliant Teeth Whitening kit (Value $149) to get your smile in check for the New Year! Simply click this link here to fill out your entry form! 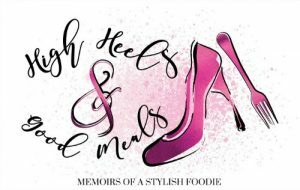 If you can’t wait for the giveaway and need your teeth whitened in time for Christmas, you can use my 15% off coupon code (highheelsandgoodmeals15) for a Smile Brilliant purchase. I’ll be hosting the giveaway here and on my social media channels so make sure you’re following me for multiple entry opportunities. Be sure to follow Smile Brilliant as well! Their IG handle is @smilebrilliant. Invite everyone you know who would want in for a chance to win their own at home whitening kit! It would make a great Christmas Gift! 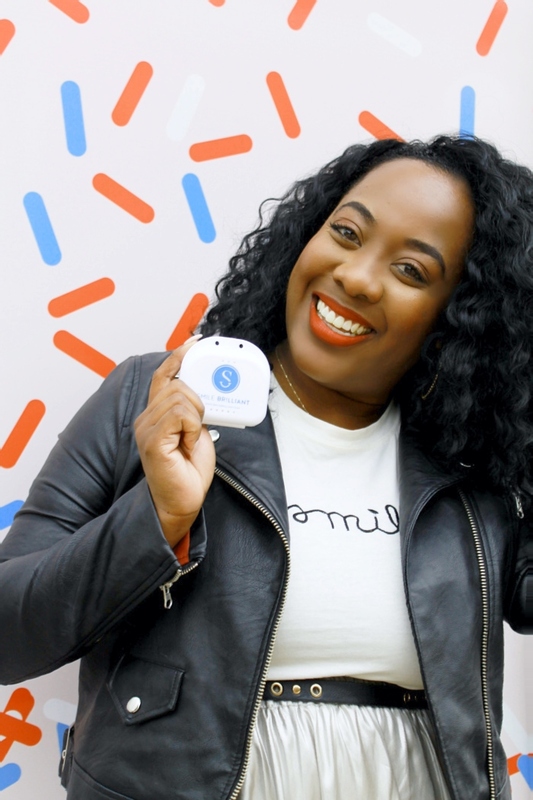 Have you ever tried an at home teeth whitening system? How did it work for you? 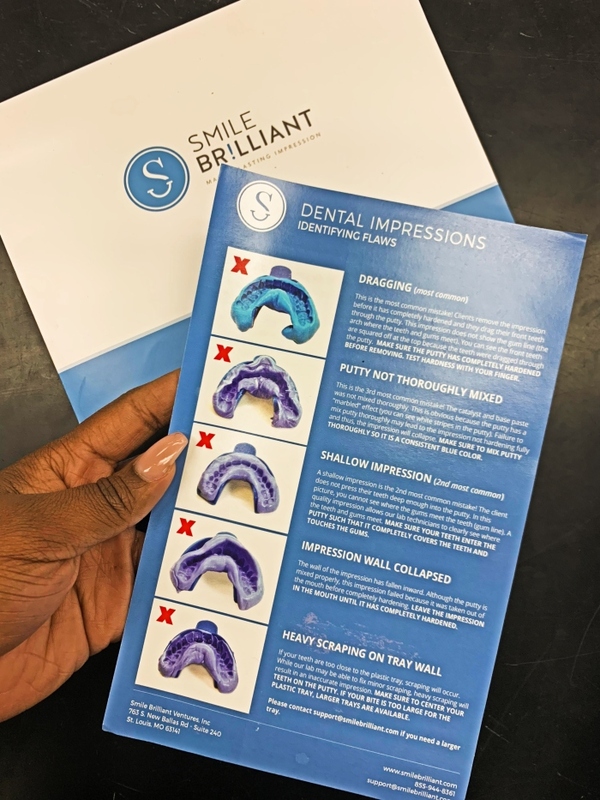 Want to give Smile Brilliant a try? Check out more giveaway details below and be sure to enter! Also, please let me know your thoughts in the comments below! The giveaway is for a $149 Smile Brilliant credit. It is open until December 18, 2018 and open to USA, UK, Australia and Canadian residents. Enter here! Best of luck to all who enter and as always, thanks so much for stopping by!